Hope everyone had a nice Valentine's Day. As a single girl, I normally try to ignore the day...lol! This year, however, I made a couple cards, one for my mom and one for her friend Reno using the Happy Heart Day stamp set from Stampin' Up. I didn't mean to, but I ended up making these at the last minute on Monday, as I had to drop them in the mail Tuesday to make sure they got to their recipients in time!! This is the card I made for my mom. I started with a card base of Pretty in Pink cut at 4 1/4 by 11 and scored at 5 1/2 inches. The Rose Red layer is ticket cornered and the flower image was randomly stamped all over in Regal Rose, and attached to the card base with adhesive. The scallop circle was cut from Pretty in Pink cardstock using the Nestabilities die cuts and my Cuttlebug and was also embossed using the Fiskars texture plates. I sponged a bit of Regal Rose ink over the embossing, and attached to the card with adhesive. I used the little mouse image with Black Stazon ink on Whisper White cardstock. I tried my hand at watercoloring with markers and a paintbrush. I have got to get me a aquapainter or waterbrush, to avoid the cup of water mess (my cat's obsession with water again...). The colors I used are Pretty in Pink, Regal Rose, and Rose Red, with a bit of Going Gray. I matted the mouse image in Pretty in Pink and then again in Regal Rose cardstock. The Regal Rose layer was distressed with the distressing tool. The mouse focal image was then attached to the card with dimensionals. The final touch is silver brads in each corner. Here is Reno's card. I cut a piece of Pretty in Pink cardstock 3x6 inches and scored at 3 inches to make a 3x3 square card. I cut a piece of Regal Rose card stock 2 3/4 inches square and stamped the flower image all over in Regal Rose ink. 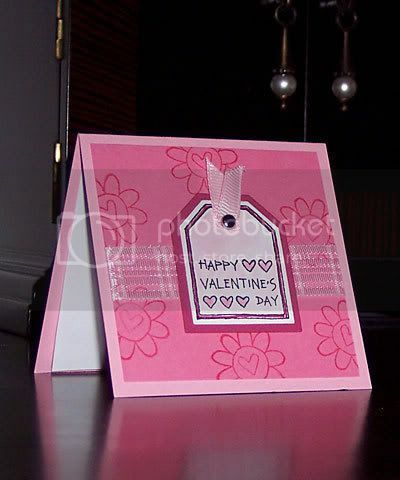 I wrapped a piece of sheer pink plaid ribbon I had in my stash around it and attached to the card base using adhesive. 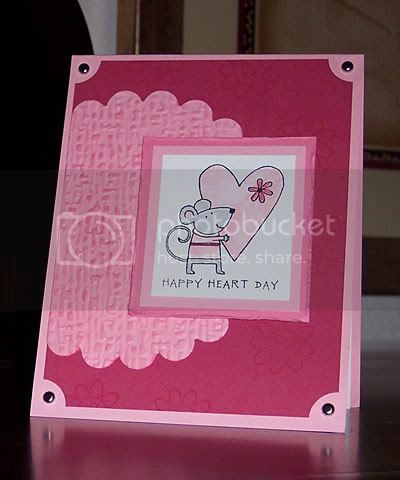 I stamped the Happy Valentine's Day tag image in Black Stazon ink on Whisper White, and watercolored it using Pretty in Pink, Regal Rose, and Rose Red markers. 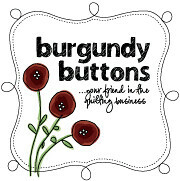 I punched out the image using the small tag punch from Stampin' Up and matted it with Rose Red using the large tag punch. I attached a piece of pink grosgrain ribbon with a silver brad and then attached the tag image with dimensionals in the center of the card front. I love these little cards! I got a Valentine from Mom, but she gave it to me early when she came over last weekend. She's caught the cardmaking bug too! Thanks for stopping by! Where are ya darlin? You haven't blogged in a while.